Monochroma, by Turkish developers Nowhere Studios, hooked me right at the start with its unique art direction and interesting game environment. Set in a 1950’s dystopian society, the whole game plays out like a silent movie. No one talks, and the whole game is colored in various shades of black, white and grey, with red being the only “real” color to make an appearance. 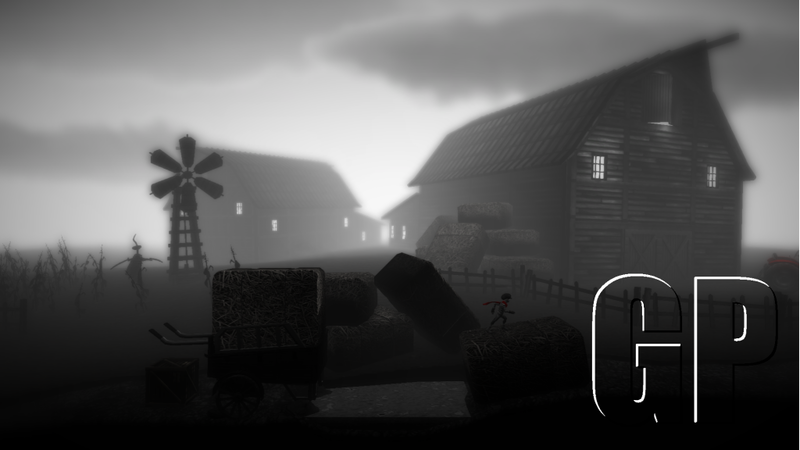 In Monochroma you play as a young boy in charge of his younger brother. They both witness a crime perpetrated by the evil corporation monopolizing the world in which they live. 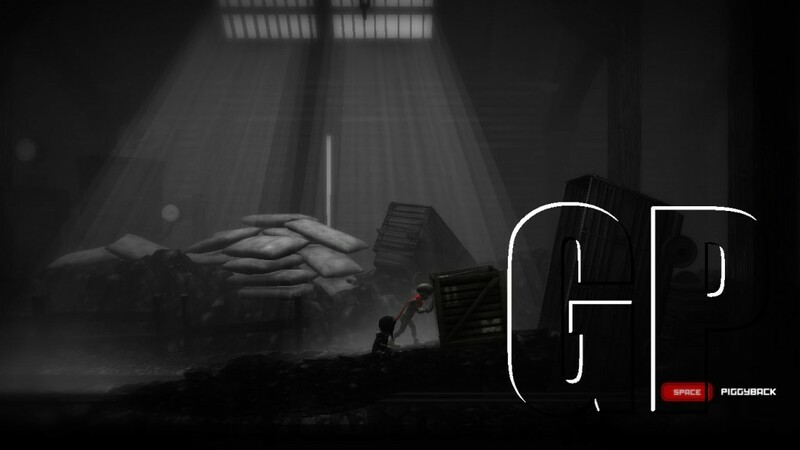 The protagonist, with his little brother in tow, traverses through rural and urban areas, solving complex puzzles along the way. With no one talking and no text to clue me in to what was going on in the world, I had to creatively fill myself in based on visual clues taken from each area. Here is the game's starting location. As the game starts out, you find yourself chasing your little brother through farmland as he flies a kite. From what I can understand, he then appears to hurt himself and needs you to carry him “piggyback” style the rest of the game. Now the weight of carrying your little brother affects how the rest of the game plays out, literally. While carrying him, you can’t jump as high and he weighs you down. 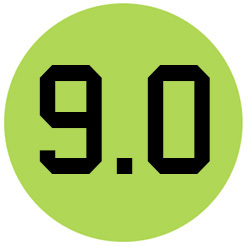 Those two factors lay the ground-work for most of the puzzles in this 2D platformer. Notice how the younger brother is sitting in the light coming from the window. Now one might say, why not just set him down someplace and solve the puzzles that way. You actually can do that, but since he’s young he has a natural fear of the dark and won’t let go of you if he’s scared. The only way to combat this obstacle is to place him down near various, conveniently located lamps and spot lights throughout the game. However, while it is way easier to advanced through game without the burden of carrying him around, Monochroma doesn’t let you stray too far away without your brother. He is also helpful in certain puzzles when extra weight is needed to find a solution. Some puzzles in Monochroma are dangerous. If you don't reach your brother in time or have one mistimed jump...dead. Controls in Monochroma couldn’t be simpler. Nowhere Studios designed this game to be so casual, you can play it with one hand tied behind your back. Literally! You just use the left and right arrow keys to move, the up arrow key to jump, spacebar to pick-up and drop-off your brother and then hold the control key to grab on to interact with objects. Some of the items include: crates, barrels, ropes and switches. For one puzzle I had to drag a flaming barrel into the rain in order to douse it before I could jump on it, using it as a platform. Without a clunky control scheme to distract me (which they often do), I was able to easily focus on the best part of Monochroma: the challenging puzzles. The evil corporation has eyes everywhere. 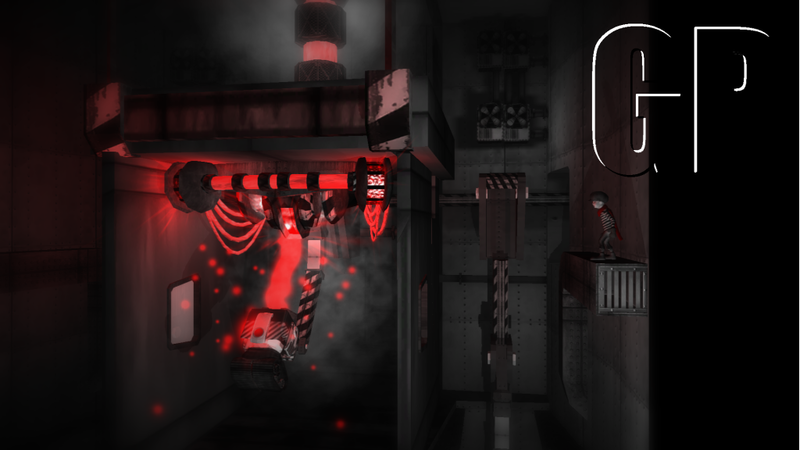 The different puzzles and challenges in Monochroma are unique and not as simple as they appear. Some puzzles are easy, such as drop your brother off, hit a switch to lower an elevator, get brother and go. But others require complex jumping and timing. One such puzzle involves needing to leave your bother irresponsibly under a giant metal storage unit hanging precariously above a lamp (the only place the brother will stay). I had to drop-off the brother, jump up into the crane’s controls and flip a switch to lower the storage unit. If I was not able to make it back to my brother before the storage unit hit the ground I’d become an only child. That is just one of the many devilish challenges Monochroma throws your way. The further you work your way into the city, the more complex and high-tech the puzzles get. 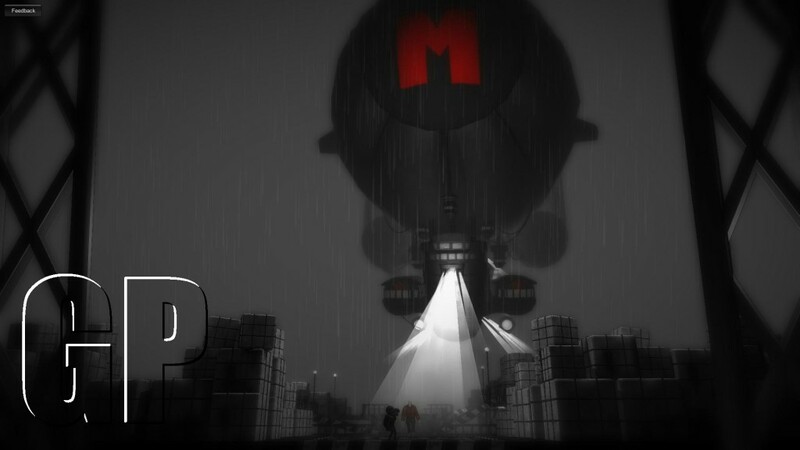 With so much to offer gamers both visually and intellectually, Monochroma should definitely be your next puzzle platformer purchase (try saying that 3x fast). Even if you don’t play puzzle games, Monochroma should still entice you with its dark art style, mysterious plot and clever challenges. Be sure to grab it on Steam when it’s released May 28, 2014.